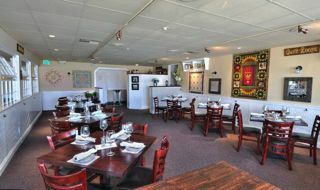 Looking for a place to go out for dinner that’s traditional and yet has a few memorable twists? 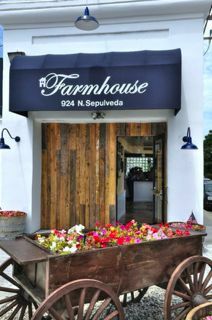 Look no further than the American Farmhouse Tavern and Grill on Sepulveda in Manhattan Beach. Now in its new, more spacious digs, the Farmhouse serves up rustic farm-to-table classics with just a touch of whimsy. And whether you’re in the quilt room (with quilts made by the owner’s mother), the tavern, or the ‘chicken coop,’ you’re sure to be well-fed by the time you leave. Dinner at the Farmhouse starts with a special ranch treat. Each table receives a tureen of vegetable stew, along with a bowl of cattleman beans and Santa Maria style salsa. You mix them together to make a fragrant (the cumin flavoring hits just the right notes) stew at your place. Next you can choose from an array of hearty sandwiches or entrees, each of which include a salad and dessert. We’re partial to the Angus burger and tri-tip sandwiches, as well as the filet mignon and the salmon. Some of our favorite sides include the sweet potato fries with a home-style apricot/pineapple jelly and beer-battered onion rings with (real) ranch dressing. When you order the salad, go for the Cabernet vinaigrette, which is tangy and just a little bit sweet. 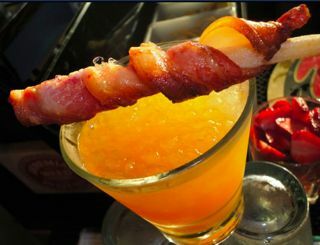 You can’t go wrong on the creative drink menu, but a perennial favorite continues to be the Buffalo Smoke (Buffalo Trace bourbon, peach nectar, St. Germaine liqueur, and a maple-smoked-bacon-wrapped stick of sugar cane. Drink this one slowly and you can imagine yourself watching the sun set from the porch of a massive ranch house after a long day on the farm. Dinner isn’t complete until you’ve had your scoop of fresh ice cream. Our friends have enjoyed various sherbets; we’re partial to the pineapple ice cream. It makes for a sweet finish to a very special meal. Note for families: The restaurant has a kids’ menu, and it also offers a “treasure chest” for kids to pick treats on the way out the door. The American Farmhouse Tavern & Grill, 924 N. Sepulveda Blvd., Manhattan Beach, CA 90266 Phone: 310-376-8044. M-F lunch 11am-2pm; dinner 5pm to close; Sat/Sun. breakfast/brunch 9 am-2pm; dinner 5pm to close. See their Facebook page for additional information and updates.